M-CNC Precision Engineering is ensuring the accuracy of components manufactured for jet powered surf boards with a range of Bowers Group bore micrometers. As a sub-contract multi-axis CNC machining company, M-CNC Precision Engineering has a range of high calibre customers requiring the highest levels of quality. Based in Somerset, the company manufactures parts for Riders Racing of Riders Motorcycles, centre plates for advanced rotary engines for Unmanned Aerial Vehicles on behalf of Rotron Power Ltd, and engine components for Mako Boardsports’ revolutionary Jet Powered Surf Boards. M-CNC Precision Engineering approached Bowers Group to help fulfil its ongoing customer demand for an increasing amount of high quality components. M-CNC needed to increase not only its capacity, but also its capability, allowing the business to produce more complex parts with minimal intervention. With clients of such high calibre, producing components of high quality and accuracy is key. Reliable, quality measurement equipment is, therefore, absolutely imperative. M-CNC estimates that the business carries out over 5000 bore measurements per week, measuring a wide variety of components for a range of applications. Regular measurement of components containing lots of bores means that M-CNC required high-quality measuring equipment to ensure that the measurements are accurate first time, from a measurement range of 10.000mm to 250.000mm. 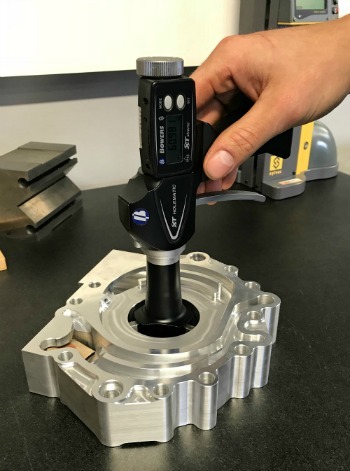 As world leader in bore gauge manufacture, Bowers Group provided M-CNC with a range of bore gauges, including Bowers’ XT3 Holematic XT3 Digital Pistol Grip Bore Gauge. With built-in Bluetooth allowing bi-directional communication with machine tools, the XT3 gives flexibility for data acquisition and storage, further contributing to M-CNC’s commitment to embracing Industry 4.0 and increasing its productivity and efficiency. In addition to a large number of bore gauges from the Bowers Group’s range, M-CNC also uses a Sylvac Hi-Cal 450 Height Gauge. 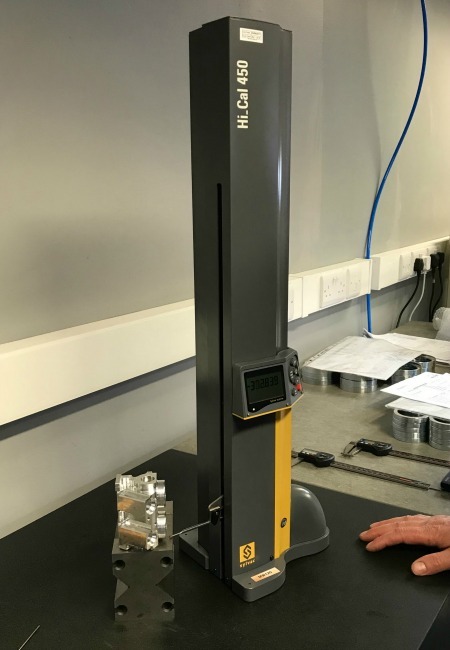 As Sylvac’s sole UK agent, Bowers Group supplied M-CNC with this digital, motorised height gauge used for a variety of measuring tasks including step heights, internal/external diameters and centre-line distances. This height gauge benefits from Sylvac's patented inductive measuring electronics and the latest motorised probing system, to give excellent repeatability and ease of use. The team at M-CNC delivers sub-contracted manufacturing of high end precision components throughout the UK, providing CNC turning and milling services to clients across the aerospace, motorsport, nuclear, medical and agricultural industries. The company currently employs 17 people with four apprentices, and is actively seeking more skilled engineers to work in its state of the art facility. A rigorous commitment to the Engineering industry means that M-CNC continually upgrades its technology to the latest specifications and builds lasting relationships with providers. Fully embracing Industry 4.0, M-CNC is always looking to increase its productivity and efficiency, and has recently invested £2.75 million 8 new DMG Mori CNC Machine Tools, 4 Mills and 4 lathes, all multi-axis, some with palletised automation and a robot cell to produce larger volumes unmanned. M-CNC place high emphasis on customer service, offering offer consultancy, impartial advice on in-house resources and implementing new manufacturing using the latest technology and machinery to make them more efficient, productive and responsive to the demands and needs of the supply chain within the engineering market.